Custom wall decals for offices. Matte finish decals, glossy effect wall art, specialty textures and more. Office wall decals are a great way to brand your work space or communicate your company philosophy to employees and visitors. Our custom office wall decal services focus on getting you the best vinyl graphics in the shortest time frame. Our office branding team will discuss your wall decal options and work with you to get exactly what you need. Custom office decals for any business. We make custom office wall decals for any business. No matter how big or small. Need a single custom decal for your home office? We’ll make it for you. 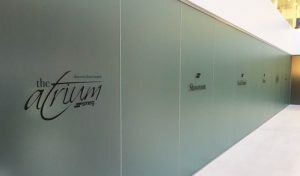 Need custom office decals for every floor in your head office? You’ve come to the right place. We offer great volume discounts alongside our professional installation services. Materials for any type of office wall art. Great custom office decals start with great materials. And we have lots when it comes to office wall decals. Matte finishes that reduce glare from light reflections. Highly reflective chrome finishes. Wood textures. Glossy finishes and a lot more. You come up with the style you want. We’ll find the best materials for your office wall art. Don’t mess up your beautiful custom office wall art when fitting it on your wall. Use our professional installation services for larger, more complex orders. Don’t need installation? No problem. We will ship them to your office. Don’t forget to watch our detailed tutorial videos in our How To page.